The American Civil War (1861–1865) falls between the two most hideous Supreme Court decisions related to race relations. In 1857, just before the Civil war started, Dred Scott v. Sandford held that slaves and their decedents could never be citizens of the United States and that their moving to a free state does not emancipate them. In 1896, long after the Civil War ended, Plessey v. Ferguson held that blacks and whites may be constitutionally segregated in public buses, schools, and other places. The first case sanctified slavery, while the second case endorsed apartheid. Between the two cases lie a bloody civil war, the emancipation of nearly four million slaves, the assassination of President Abraham Lincoln, three constitutional amendments (13th, 14th, and 15th) prescribing racial equality, the secession of Southern states and their readmission into the Union, and decades of carpet-bagging and political corruption. 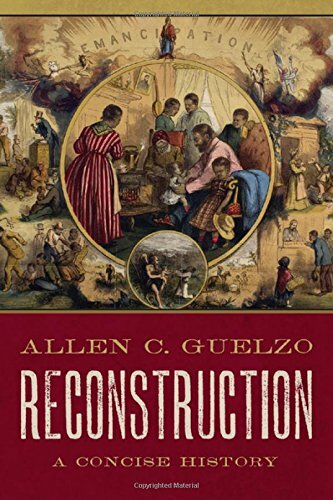 Allen Guelzo’s book examines a period of 12 years (1865–1877), known as the Reconstruction, “the ugly duckling of American history,” to explore and “epilogue” the momentous struggle between various social and political forces, including Congress and presidents, to reconstruct the South in the image of the North, and to alter race relations between blacks and whites. While the Northern whites were resolute about the abolition of slavery they were hesitant in extending full equality to blacks. Unfortunately, as Reconstruction demonstrates, the rhetoric of freeing the bodies and spirit of the slaves, reconstructing the Union in which labor is freely contracted, and the promise of constitutional amendments to offer equal protection of laws failed to bring about the “dream” change. The North won the Civil War, and yet the South successfully replaced slavery with apartheid. The book appears to be psychoanalytical but poorly so. The seven chapters are titled Vengeance, Alienation, Arrogance, Resistance, Distraction, Law, and Dissension. Except for the sixth chapter called Law, all other titles signal a behavioral approach to the Reconstruction history. Note that most titled behaviors are negative. Thus, the book is written from a pessimistic viewpoint, and rightfully so, to show how various social and political forces, in the North and the South, motivated by negative mindsets, such as vengeance and arrogance, undermined the goodness of freeing the slaves. Reconstruction is reality chronicle where all major characters are flawed and while fighting for conflicting ends, they conspire to defeat the moral of the story: freedom for all. Put more starkly, the book might be interpreted to imply that white political factions fighting with each other over the liberation of blacks eventually conciliate but without benefitting the blacks. The paltry results did not justify the cost of the war in economic and human terms. Guelzo rightly concludes that rapprochement between the contending North-South political forces and a relatively rapid readmission of rebel states into the Union makes it clear that for Republicans and Democrats the nation’s territorial integrity was far more important than the equality of races. The North refrained from the stiff punishment of the rebel forces, abandoned the idea of redistributing the masters’ land to the freed slaves, and allowed the South to reestablish its racial hegemony through means other than the outlawed slavery. Reconstruction implies but does not make an important point that the “morality” of a people cannot be changed through the barrel of a gun. The South did not believe that blacks were equal to whites in art, craft, or intelligence. The Southerners were wrong but that was what they believed. The Northerners waged the war to alter the South’s morality but failed to carry through their conviction. Consequently, slavery mutated into Black Codes, vagrancy laws demanding forced servitude, sharecropping, segregation, discrimination, poll tax, lynching, and the rise of hate groups, including the Ku Klux Klan. The Civil War was an ineffective war. The moral regime in race relations would not change for at least another hundred years until segregation was outlawed and blatant discrimination laws were torn down in the 1960s. Meanwhile, the Southerner attitudes toward blacks underwent a slow but incomplete transformation. Sadly, the race problems still fester and hate crimes have spread across the nation targeting various communities. The dubious thesis of changing morality with the military is pertinent even in our day. Reconstruction provides an excellent case study to instruct the United States policymakers promoting liberal democracy in the world. Recent American wars in the Middle East and the military threats to Iran and North Korea are defended in the name of national security but these military undertakings and threats also mimic the “moralistic” language of Reconstruction. Disregarding the teachings of Reconstruction, using force for changing foreign cultures remains an unfortunate part of the American policy. Guelzo’s Reconstruction should be a required reading at the Pentagon and U.S. war colleges. Unfortunately, however, the book is missing a chapter on the contribution of Christianity to the defense of slavery and presumed black inferiority. For example, Thomas Roots Cobb (1823–62), a founder of the Georgia University School of Law, and an outspoken apologist for slavery and secession from the Union derived his ideas from natural law and Christianity. Cobb was killed during the Civil War, but his ideas reflected the Southern morality about the enslavement of blacks. In the North, too, there was palpable Christian fervor in opposing slavery. Any history of Reconstruction, even a short one, is incomplete without an examination of the role of Christianity in resisting (and fostering) the ideas of racial equality. America was a highly Christianized nation in the mid-19th century, evidenced by the number of new churches built. Guelzo, with a degree in divinity studies, is uniquely qualified to examine the Christian affirmation of slavery in the Civil War. He has elsewhere indicated how “the Civil War corrupted American religion.” A Christian dimension of Southern resistance to emancipation fits well with the behavioral framework of Reconstruction: A Concise History. Guelzo is a prize-winning historian, sermonic speaker, and prolific writer, focusing mostly on the dynamics and effects of the Civil War. His research and viewpoints are creditable. However, Reconstruction does not reveal any new research or analysis. It is a short book on familiar themes, characters, and events, written perhaps for the general public or as a companion book in college courses on American history. Many convenience tools add value to the substance of the book. For example, the “Timeline” is helpful in keeping temporal track of events, including numerous deaths and assassinations of key players. The endnotes and bibliography covering 35 pages of this short book are valuable sources for students writing research papers. The black and white pictures dispersed throughout the pages render the book a pleasant archival look. An 1871 picture of the Ku Klux Klan tribunal attempting to lynch a “strict and earnest” Republican—kneeling down with a rope around his neck—captures the ironies of a failed war waged to reconstruct the Southern mindset.